Economic Growth Picked Up Slightly In Third Quarter : The Two-Way The news is sure to be a hot topic on the campaign trail as President Obama and Republican challenger Mitt Romney push to the Nov. 6 election. 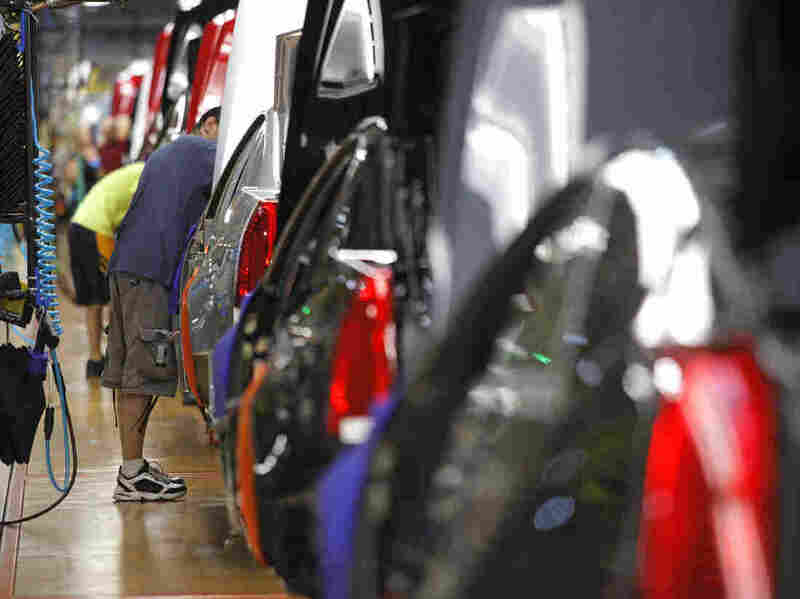 A GM assembly line in Lansing, Mich. The U.S. economy grew at a 2 percent annual rate in the third quarter, the Bureau of Economic Analysis says. That follows growth (at annual rates) of 1.3 percent in the second quarter and 2 percent in the first. At 2 percent, the third-quarter estimate is a bit better than the 1.8 percent that economists were expecting, Bloomberg News says. But this is just the first of three estimates of third-quarter growth, and it's likely there will be revisions in coming months. -- A scant 0.1 percent annual rate in the first quarter. -- 2.5 percent in the second quarter. -- 1.3 percent in the third. -- 4.1 percent in the fourth. The economy, of course, is the top issue in this year's presidential campaign. The last major economic news due before Election Day on Nov. 6 is the October employment report, which the Bureau of Labor Statistics is scheduled to release next Friday — Nov. 2 — at 8:30 a.m. ET. The nation's official unemployment rate declined to 7.8 percent in September, BLS said earlier this month.